Other developers can be used with Efke films as well. Rodinal and Pyro PMK are popular with many of our customers. As with all films, individual testing for personal film speed and developing times are necessary for best results. Excellent for processing as a B&W slide using dr5 B&W chrome processing services! Freestyle customers get a 10% discount on their B&W film reversal processing when using dr5. 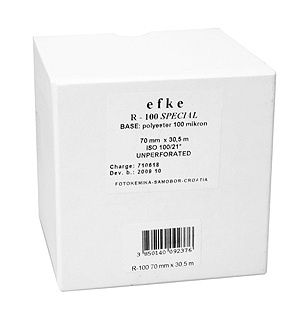 Click here for more information on using Efke 100 for B&W Slides and for processing services.